"We did a quick orbit to port, coming behind him and chasing him for about 15-20 miles. We were on his tail and gave him a 2-3 second burst of cannon and m.g. from about 250-100 yards. Pulling from about 500 ft. strikes on fuselage were followed by a ball of fire which enabled us to identify E/A as a 410. A large piece broke off to the left and he went down. The observer saw him go in and explode and burn on the ground. 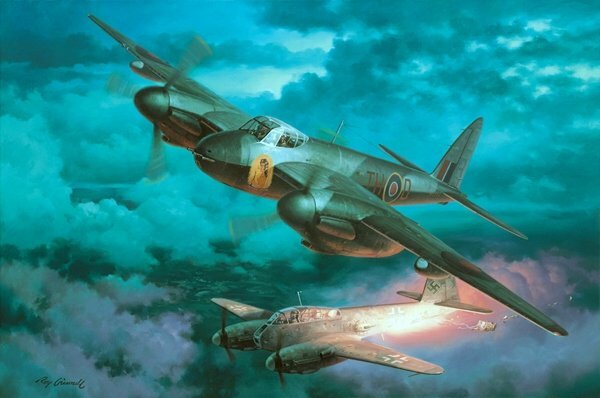 Two pieces of plywood were found imbedded in the leading edge of the Mosquito's starboard wing on return to the base." Hand signed by the Ace JAMES F. LUMA and artist ROY GRINNELL.